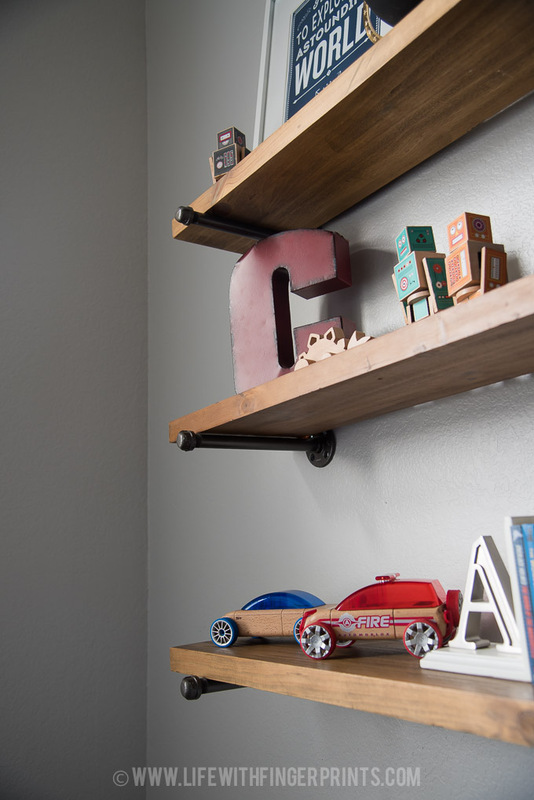 I was at a DownEast Home one day when I found these plank shelves from West Elm for $10 a piece. I snatched up the three shelves they had and knew exactly how I wanted to use them. I tend to like the industrial look -I like when metals mix with wood. 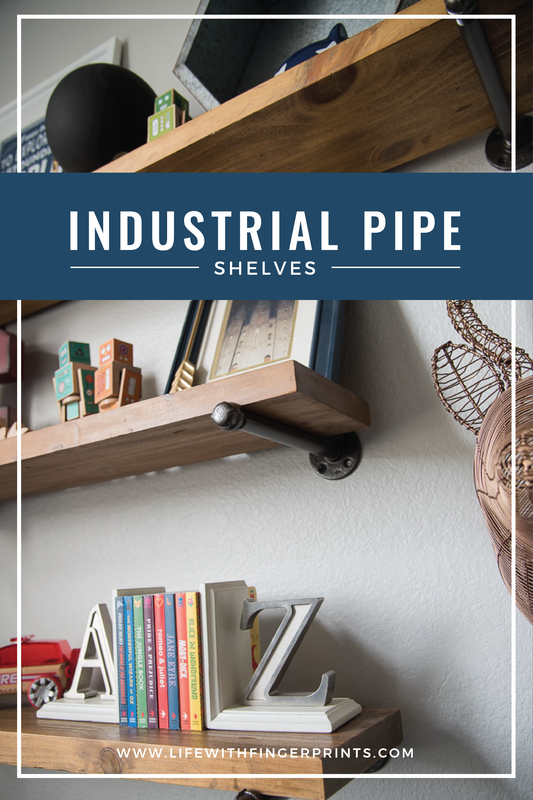 Several years back I opted for industrial pipe for our curtain rods and I’ve loved the look and feel. Using the same material as the curtain rods, I made shelf brackets. 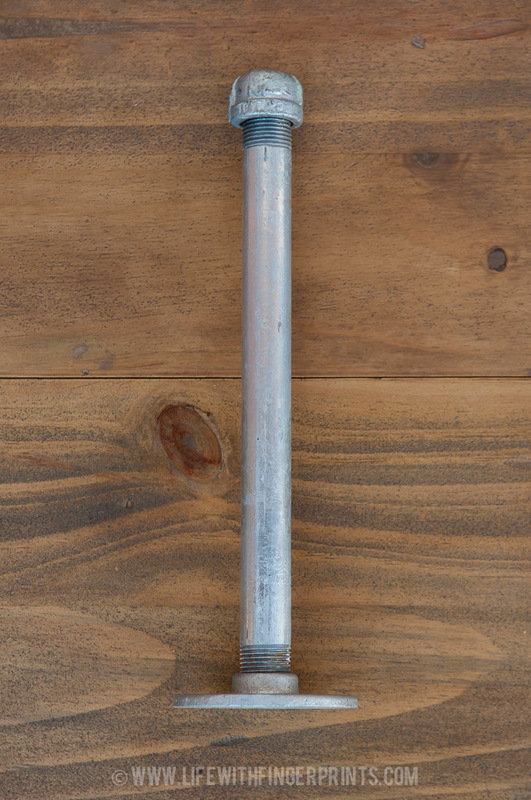 I used 1/2″ pipe and it comes precut in 8″, 10″ or 12″ lengths. You’ll also need a flange and a cap and spray paint in the color of your choice. 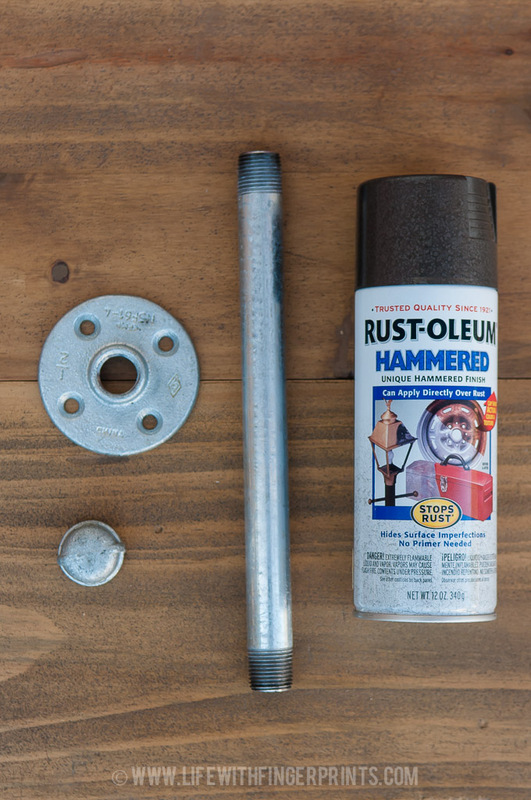 I like the hammered spray paint by Rustoleum – it gives a durable finish. 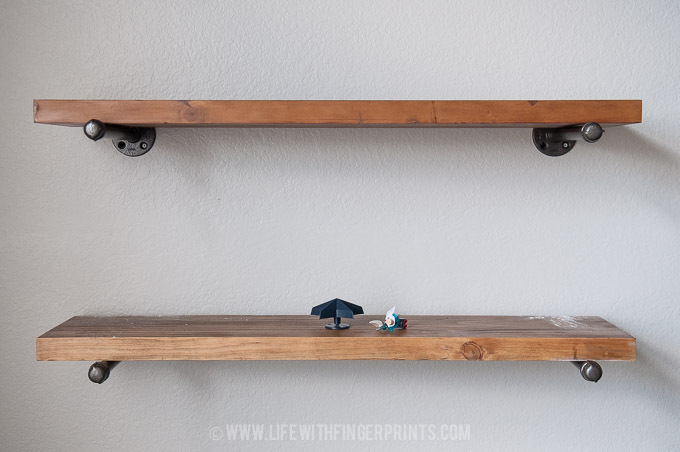 My shelves aren’t very wide, so I only needed two brackets per shelf. I screwed the pipe directly into the wall through the flange. It would’ve been ideal to screw them into a stud – but there never seems to be a stud where I need it. So I used some strong mollies in the drywall to screw into to prevent them from ripping out. 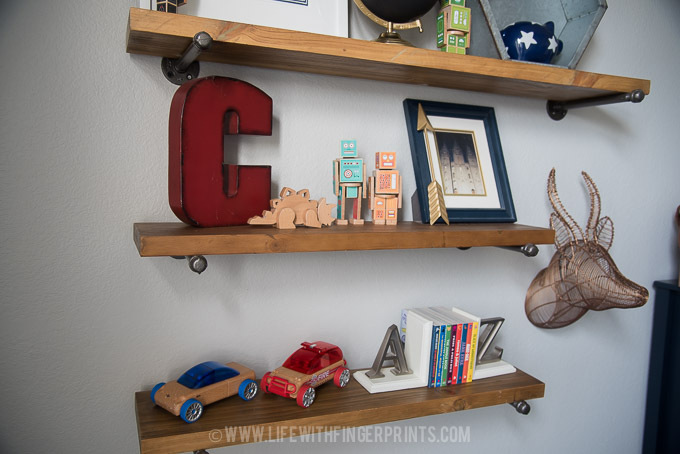 The shelves are just sitting on the brackets. 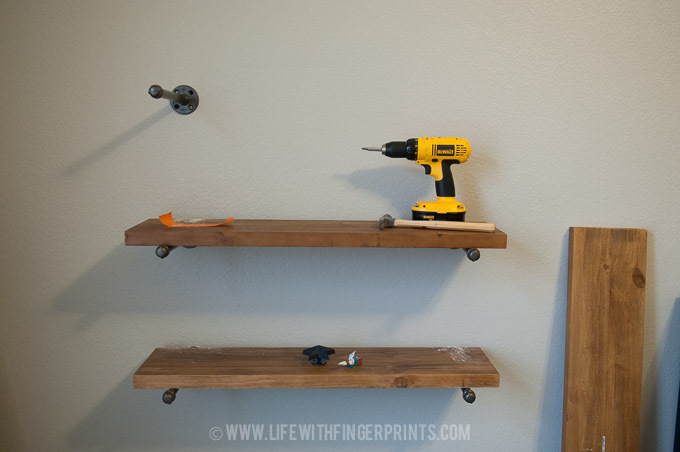 For safety, you can add a pipe bracket underneath that would screw into the wood to keep it in place. 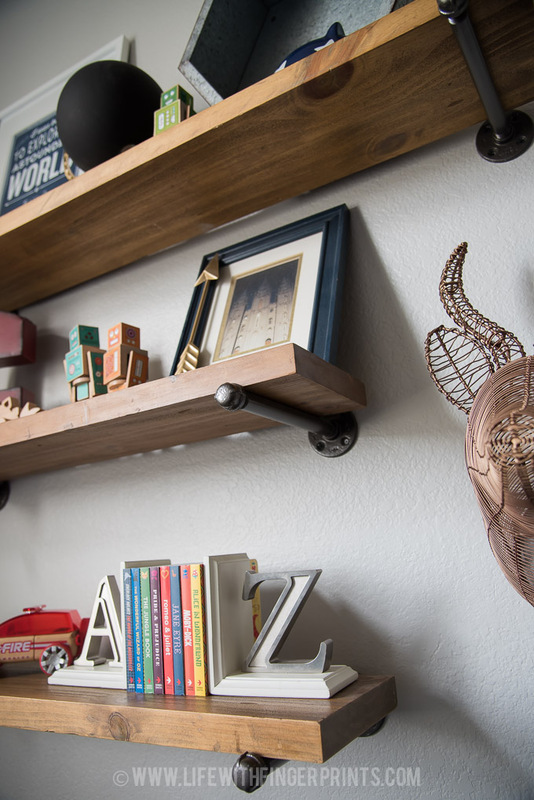 I really don’t like the staging part of these projects, but after a year we finally have items sitting on the shelves. I ended up using his toys/books as the decorations. Not toys that were purchased to be cute on a shelf, but the toys he actually plays with, the robots, cars, wooden dinosaur and Baby Lit books. So it really only looks like this every week when I tidy up the room and put everything back in its place. 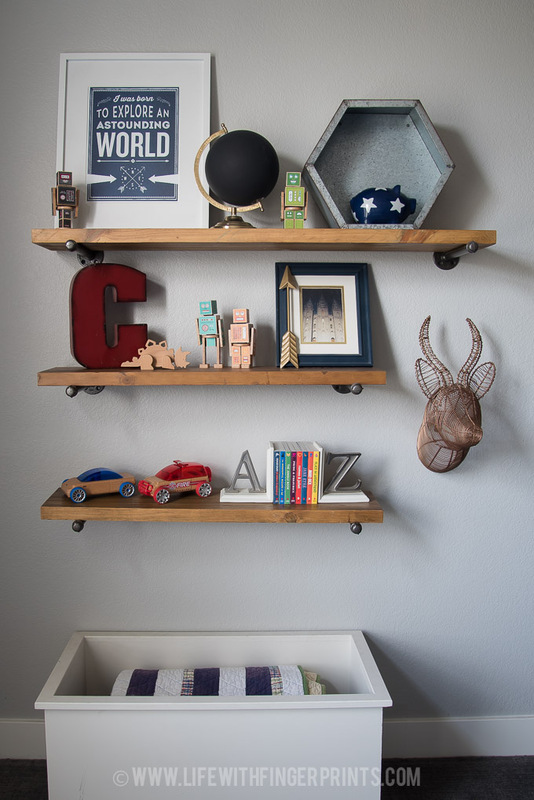 The shelves ended up being more functional than decorative and they fit the space perfectly.